Sai Baba of Shirdi aka Shirdi Sai Baba, is regarded as a godly saint by his followers, including Hindus, Muslims and other faiths. Some of his Hindu devotees believe that he was an incarnation of Shiva or Dattatreya. Sai Baba taught a moral code of love, forgiveness, helping others, contentment, inner peace, devotion to God and guru. He practiced Hindu and Muslim rituals. One of his well known epigrams says of God: ‘Sabka Malik Ek Hai’ (One God governs all). He frequently used to say, ‘Allah Malik’ (God is Master). The most important source about Baba's life is the Shri Sai Satcharita, written in Marathi in 1916 by Govindrao Raghunath Dabholkar, apart from several other books. Also, several movies and television presentations have been produced on Sai Baba’s life and teachings. Not much is known about his birth or early life. According to legends, Baba arrived at the village of Shirdi in the Ahmednagar district of Maharashtra, India, when he was about 16 years old. 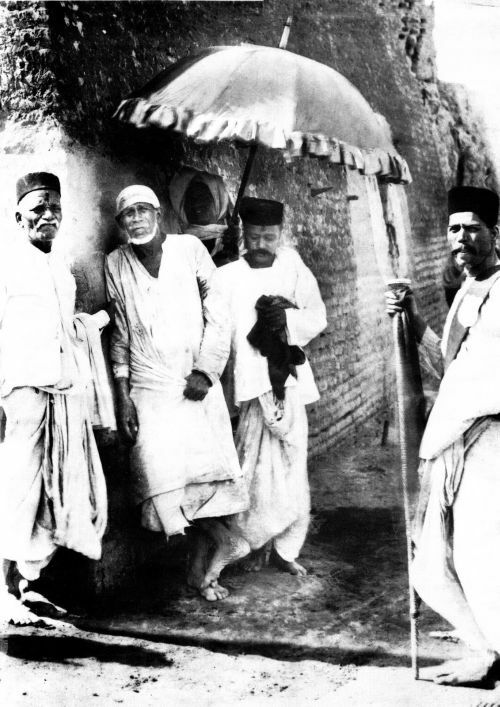 It is generally believed that Baba stayed in Shirdi for three years, disappeared for a year and returned around 1858, which indicates his possible birth year as 1838. Sai Baba attracted the curiosity of the villagers, and the religiously-inclined people regularly visited him, while the Shirdi village children considered him mad and threw stones at him. After some time he left the village, and it is unknown where he was, though there are some indications that he spent time with many saints and fakirs, and even worked as a weaver. 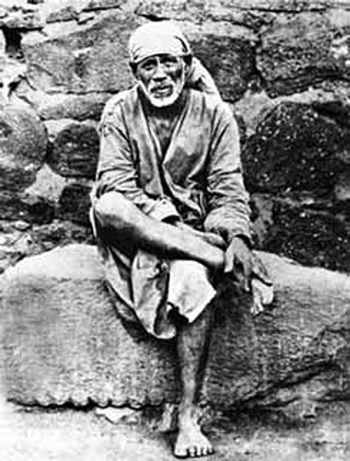 In 1858 Sai Baba returned to Shirdi, when the Khandoba Temple priest greeted him with the words "Ya Sai" (Welcome saint!). 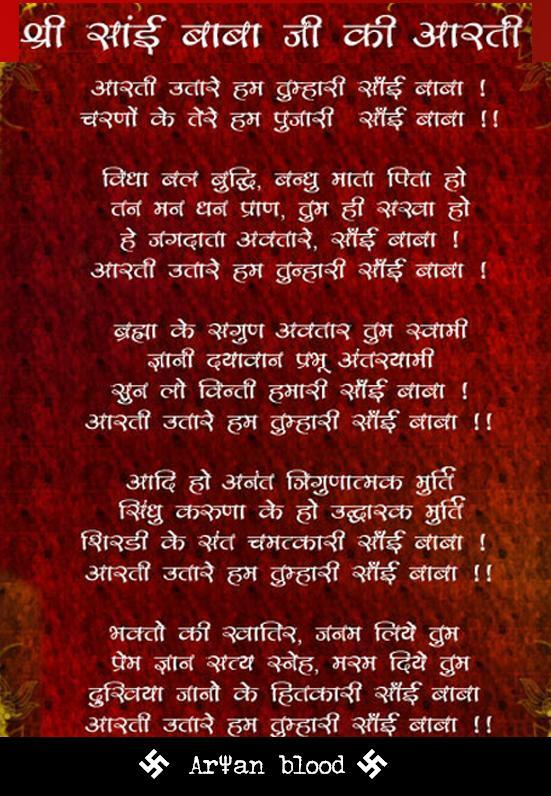 From this, the name Sai stuck to him and later he was being called Sai Baba. It was around this time that Baba adopted his dress style consisting of a knee-length one-piece robe (Kafni) and a cloth cap, and he sported long hair' when he returned to Shirdi. He never had his head shaved. For about five years Baba lived under a Neem (Azadirachta indica) tree. He often wandered for long periods in the jungles in and around Shirdi. He undertook long periods of meditation. Later, Baba was persuaded by the local people to take shelter in an old mosque, where he led a solitary life. He survived by begging for alms. In the mosque he maintained a sacred fire, referred to as a Dhuni, from which he had the custom of giving sacred ash ('Udhi') to his guests. 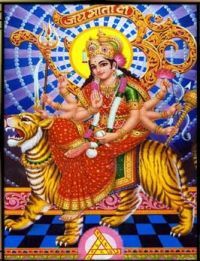 It was believed to have powers for healing and protection from dangerous situations. Initially, Sai Baba is believed to have functioned as a Hakim and treated the sick by application of Udhi. Baba also delivered spiritual advice to his visitors. He recommended the reading of sacred Hindu texts along with the Qur'an, insisting on the indispensability of the unbroken remembrance of God's name. He also participated in local religious festivals. He used to prepare food for his visitors, which he distributed to them as Prasad. After 1910 Sai Baba's fame began to spread in Mumbai, when many people started visiting him, revering him as a saint, or even an avatar, capable of performing miracles. Sai Baba neither nominated his spiritual heirs, nor initiated disciples, despite requests from some of his devotees, though some of them later became famous as spiritual figures, such as Upasni Maharaj of Sakori and Meher Baba of Ahmednagar. Sai Baba shunned any kind of regular rituals but allowed the practice of Namaz, chanting of Al-Fatiha, and Qur'an readings at Muslim festival times. Sai Baba also opposed all sorts of persecutions and discriminations on religious or caste grounds, and opposed superiority and orthodoxy based on caste and birth. Although Sai Baba himself led the life of an ascetic, he advised his followers to lead family lives. Sai Baba encouraged his devotees to pray, chant God's name and read Holy Scriptures such as Qur'an, Ramayana, Vishnu Sahasranam, Bhagavad Gita and Yoga Vasistha. He advised his followers to lead a moral life, help others, and love every living being without any discrimination. In his teachings Sai Baba emphasized the importance of performing one's duties without attachment to earthly matters and being always content regardless of the situation. Sai Baba had a profound knowledge of Muslim and Hindu religious texts. He explained the meaning of the Hindu scriptures in the spirit of Advaita Vedanta, and emphasized the elements of Bhakti. The Hindu spiritual paths of Bhakti Yoga, Jnana Yoga and Karma Yoga were pronounced in the teachings of Baba. An example of the way he combined both faiths is the Hindu name Dwarakamai that he gave to the mosque where stayed. Sai Baba taught that God penetrates everything and lives in every being, and God is the essence of each of them. Baba said that the world and all that the humans may have is transient and only God and his gifts are eternal. Sai Baba also emphasized the importance of devotion to God (Bhakti) and surrender to His will. He advised his followers to overcome the negative features of character and develop positive ones. He taught them that one’s fate is determined by Karma. Sai Baba left no written works for posterity. His teachings were oral, typically short, pithy sayings, rather than elaborate discourses. Baba used to ask his followers for money (Dakshina), which he would give away to the poor the same day and spend the rest on buying wood to maintain the Dhuni. According to his followers he did so in order to rid them of greed and material attachment. Baba emphasized the importance of sharing with others. He said, "Unless there is some relationship or connection, nobody goes anywhere. If any men, or creatures, come to you, do not discourteously drive them away, but receive them well and treat them with due respect. Shri Hari (God) will be certainly pleased if you give water to the thirsty, bread to the hungry, clothes to the naked and your verandah to strangers for sitting and resting. If anybody wants any money from you and you are not inclined to give, do not give, but do not bark at him like a dog." Other favorite sayings of his were, "Why do you fear when I am here", "He has no beginning... He has no end." The Shirdi Sai Baba Movement began during his lifetime with a small group of Shirdi inhabitants and a few people from other parts of India. It started growing in the 20th century. During his lifetime Hindus worshipped him with Hindu rituals and Muslims revered him greatly as a saint. In the last years of Sai Baba's life, Christians and Zoroastrians started joining the Shirdi Sai Movement. Around twenty thousand pilgrims visit the Sai Baba Mandir in Shirdi every day, and during religious festivals it will be a hundred thousand. A spiritual organization of Baba's devotees, Shri Saibaba Sansthan Trust is based there. The first ever Sai Baba Temple is situated at Bhivpuri, Karjat, in the Indian state of Maharashtra. While there are at least one Sai Baba Mandir in most Indian cities, the Shirdi Sai Movement has also spread to other countries such as USA, Australia, Malaysia, Singapore, and in the Caribbean countries. Sai Baba's disciples believe that he had performed many miracles. Inhabitants of Shirdi talked about these miracles and wrote about how they were witnesses of his unusual Yogic powers such as levitation, entering a state of Samadhi at wish, even removing his limbs and sticking them back to his body (Khanda Yoga) or doing the same with his intestines. Some of his followers claimed he appeared to them after his death, in dreams, visions and even in bodily form, whence he often gave them advice. In the mosque in Shirdi in which Sai Baba lived there is a life-size portrait of him. Numerous monuments and statues depicting Sai Baba have also been built after his death. A marble statue is in the Samadhi Mandir in Shirdi where Sai Baba was buried. Photo: To Sai Baba's right is Gopal Rao Mukund Buti, a millionaire of Nagpur. Behind Baba and holding the umbrella is Bhagoji Shinde, his devotee whose leprosy was cured by Baba. To Baba's left is Nanasaheb Nimonkar, a devotee.